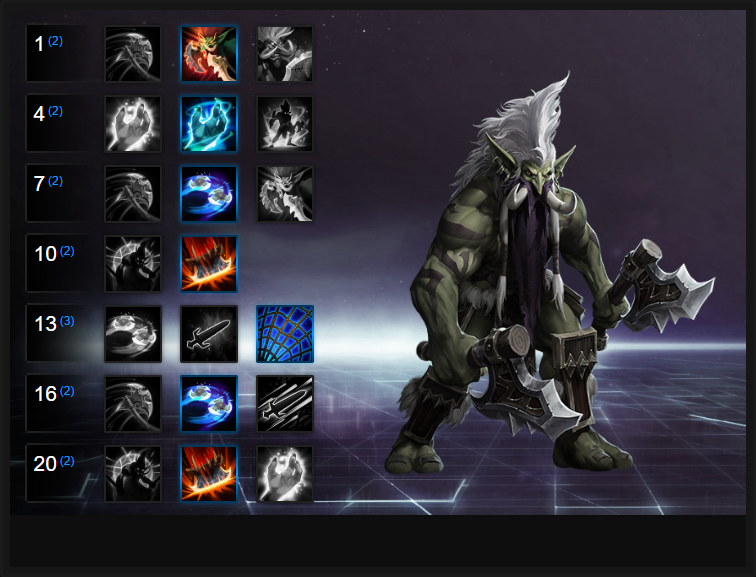 In this Zul'jin Build Guide, we provide an overview of his strengths, abilities, talents and matchups. Zul'jin is a ranged assassin that grows in power as he loses his health. His trait provides passive attack speed bonuses when his health is lowered and when activated, instantly boosts his basic attack damage by 25% at a cost of his maximum health. He's effectively a berserker and has to carefully balance his health versus damage output in order to truly maximize his damage. In many respects this makes Zul'jin a high risk, high reward Hero. In order to be truly effective with him you have to really push how little health you have as this significantly increases your damage output. At the same time, you need to take care when low health because you can be instantly killed. What's particularly interesting about Zul'jin is that one of his abilities allows him to restore his own health, providing some much needed sustain when you've sacrificed your health. Unfortunately it needs to be channeled so once again you'll need to rely on your own intuition as to when to replenish your health, or when to stay and fight. In comparison to many Heroes I'd consider Zul'jin fairly complex simply because of your need to manage your abilities, trait, healthpool and to still keep an eye on the enemy and their movements. That said, if you can manage to handle all this Zul'jin is incredibly powerful. Berserker (Trait) - When activated Berserker increases Zul'jin's basic attack damage by 25% and begins to deplete his health by 2% per attack. As its passive, you gain 1% attack speed for every 1% of of your maximum health that's missing. Simply put, the less health you have the quicker you'll attack. At the same time, that attack speed - and rapid delivery of basic attacks - will quickly deplete your health. Key to using his trait correctly is knowing when you do or don't need the extra damage. When laning for example, there's no real need for the 25% attack damage increase, but during a team fight you'll want to keep it on at all times until your health gets a little too low. Grievous Throw (Q) - Your primary ability for bolstering your damage, Grievous Throw allows you to strike through two enemies and mark them for 6 seconds. Those marked take 50% bonus damage from your next 3 basic attacks, effectively allowing you to quickly spike someone down. If you also combine this with your trait, your basic attacks deal a huge amount of damage even if the window of opportunity is small. I'd also add that if you can, try to only use Grievous Throw when you know you can land the basics off - without a default slow (or movement speed ability) you can often waste the ability when an enemy moves away. Twin Cleave (W) - An ability that takes a little practice, Twin Cleave has a unique telegraph and is perfectly circular. You can choose where to position the blades and they fly from Zul'jin out towards the enemy and back in again (like a double boomerang). The damage isn't amazing, but if you manage to hit both axes on the way out and back it's significant. If you can hit multiple targets it can comfortably pressure the enemy while the slow of 15% per axe is helpful when chasing someone down. Regeneration (E) - Providing Zul'jin with some much needed sustain, Regeneration is a heal over time that needs to be chanelled. If you take damage during it, the heal will fail despite its projected return. If you can, try to always back off when using it or deny line of sight. If you've a strong front line, you can usually get away with quickly firing it off without too much risk. I will add however that by default, it doesn't heal for much but is often enough to keep you topped up. Taz'dingo! (Heroic) - Without doubt the Heroic of choice, Taz'dingo! provides Zul'jin immunity for 4 seconds. You can still take damage during it, but you can't have your health reduced past 1. What's particularly powerful about Taz'dingo is that it not only mitigates all incoming damage, but often buys you more than enough time to finish an enemy off or to have your team heal/shield you. It's best used just as you're near death so that you gain the full 4 seconds of damage against the enemy. Guillotine (Heroic) - Doing exactly what it says on the tin, Guillotine is a high damage Heroic that strikes down near instantly. Its default damage at level 20 is around 500 but if you're on 1% health, reaches as high as 2300 in a single strike. For the most part you aren't ever going to find yourself this low, but it's fairly easy to have its damage increased to at least 1500 when you're at 25% health. Its radius isn't large, and is relatively thin so be careful when aiming it as it's easy to miss with if you cast it in a hurry. Recklessness allows Zul'jin to gain increased basic attack damage, and Spell Power when below health thresholds (75% and 50% respectively). The values, especially at 50% health or below for Spell Power are significant (a 20% increase). The bump is so great that it pretty much determines Zul'jin focuses on Twin Cleave. With Armani Rage having been made baseline, Voodoo Shuffle is a mandatory talent that allows Zul'jin to remove any slows or roots made against him. A simple, but effective Talent. Building on the fact Zul'jin can now instantly lose 50% of his health, and gain +20% Spell Power in the process, Arcanite Axes is a no-brainer. It allows you to gain +0.75 damage for each Hero you hit. Simply put, it's a stacking bonus that - eventually - allows it to deal eye watering damage. Guillotine is the way to go on Zul'jin right now simply because he is so heavily reliant on Spell Power and Twin Cleave over basics. Having the ability to instantly halve your health, for a massive burst of damage, can bypass most healing and soften up (or kill) a group of enemies. Allowing Zul'jin to root an opponent for 1.5 seconds from a reasonable distance, Ensnare gaurentees he can land Guillotine and Twin Cleave at the same time against a single opponent, causing massive damage. Allowing Guillotine to roll forwards after it lands, Buzzsaw heals Zul'jin to full if an enemy is killed. Although the roll damage is lowered (75%) the additional output as it cuts in a straight line can often kill stray enemies who aren't aware of its flight path. These Hero Threat Levels (1 being lowest threat and 10 being highest threat) are to help you determine which enemy Heroes can give you a headache. For the Heroes listed here, take extra care as they're particularly dangerous for Zul'in. Lunara: Her mobility, nuisance poison and vision make her a challenge for Zul'jin. You can poke her down, but she can comfortably harrass you as well. This list of tips and tricks are just a handful of things we think will help your Zul'jin play. We'll continue to add to the list as required and if you have any tips you'd like to share, let us know in the comments below and we'll place them here. 1. Remember that your trait only reduces your health when you use basic attacks. You can keep it on as long as you wish if you aren't attacking. 2. When laning, I'd recommend you don't use your trait. The damage bonus is nice, but you'll quickly sacrifice your health and mana. 3. Zul'jin is mana intensive if you're constantly using Regeneration. Try to use health globes/fountains to keep your mana topped up, instead of automatically using the ability. 4. I wouldn't recommend using Grievous Throw or Twin Cleave when laning. Neither offer amazing clear and will simply waste your mana. It's more efficient to just use your basic attacks. 5. Regeneration will project your health return and if you take damage during the channel, you'll only get a portion back based on how long you did manage to channel for. Try to always complete the channel (or there abouts) to ensure your mana isn't wasted. 6. If you attempt to use Regenerate and take damage, it will still go on cooldown. 7. When you reach 1 health with your trait active you won't die and it will stay on. 8. Zul'jin only attacks quicker when he lowers his health. At 1 health you'll have (by default) 100% extra attack speed. 9. Zul'jin pairs incredibly well with Heroes such as Brightwing, Tassadar, Rehgar and Malfurion. They can constantly supply him with a steady stream of healing, allowing him to comfortably keep himself alive. 10. Rehgar paired with Zul'jin using Bloodlust is outrageous. His health return makes him near unstoppable if he's already low health. 11. Try to use Twin Cleave when enemies are grouped together or running away. You can aim the blades as they arc out, so aim slightly ahead of your target. 12. Grievous Blade can strike two enemies at once. If you're doing a camp, ensure you line up your shot to debuff two - allowing you to then deal maximum damage against both. 13. Zul'jin excels on Battlegrounds where he can attack a single target continuously. On Battlefield of Eternity for example, if he's low health he can rip them down in seconds. 14. Remember that once Taz'dingo! ends and until you're level 20, you will still have 1 health. Be sure to position yourself so that when it does end, you can quickly use Regeneration.